These three words don’t convey much excitement, but they do speak volumes when selecting a place for you or your loved one to receive health care. When selecting a rehab facility, you want to choose a location that propels you on the road to recovery without encountering speed bumps along the way. A return trip to the hospital slows down your recovery significantly. ARMS is proud to report that our patients do better—year-after-year–whether we look at our own internal data or consider Medicare’s reports. The bottom line is that rehab patients in facilities where ARMS works have a much lower risk of being re-admitted to the hospital or returning to the emergency room. Patients have the right to choose where to receive short-term rehabilitation or long-term care. That choice matters! There is wide variation in quality of care, even within the same geographical area. Patients need to make an informed decision to seek out providers that work hard to deliver high-quality care. ARMS is a group of multi-specialty physicians and nurse practitioners who are experienced in providing near hospital-level care in the post-hospital setting. ARMS embraces the medical needs of patients and helps them transition through various stages of care on the road to recovery. home health agencies and other providers, ARMS is able to provide a high level of involvement that was previously unheard of in post-hospital care. ARMS providers have extensive experience treating hospitalized patients and they are trained to identify and resolve problems quickly and efficiently. The ARMS care model takes a proactive, physician-driven approach that results in the highest level of care outside of a hospital setting. This industry-changing approach is leading to improved quality, and a reduction in both rehab length of stay and unnecessary hospital readmissions. 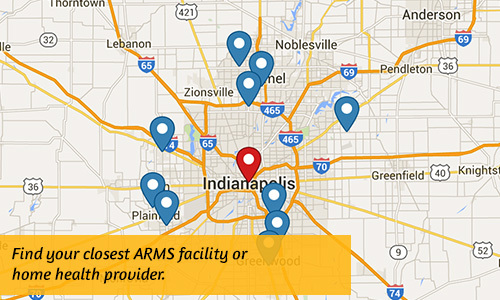 ARMS has consistently reduced the risk of return to the hospital for its patients – at a rate that is about half of the national average!